Happy (almost) February! We are another great batch of client features that we can’t wait to share with everyone, including Brides.com, Huffington Post, AllSeated and more. Keep scrolling to check it all out! 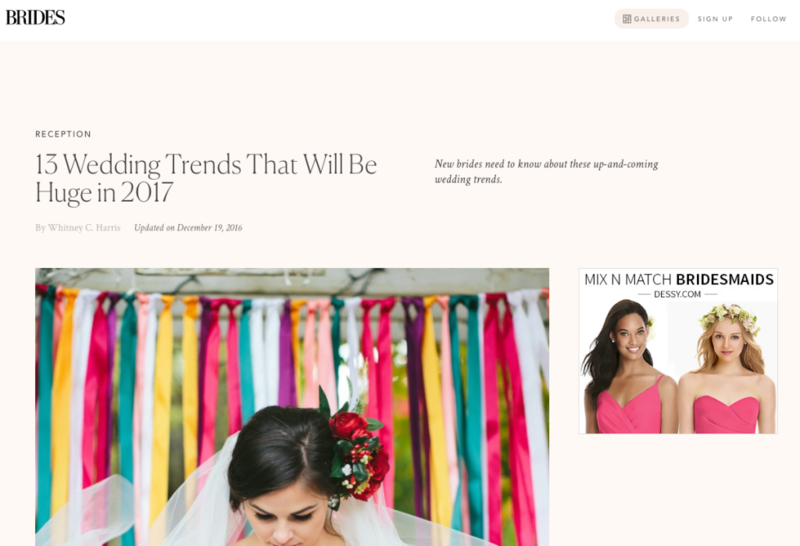 Cocoon Events Management Group, Nahid’s Global Events, Fantasy Sound Event Services, LadyMarry, Ann & Kam Photography, Passport to Joy, 100 Candles, and Destination Weddings Travel Group were featured in the Brides.com article, 13 Wedding Trends That Will Be Huge in 2017. See the full feature here. LadyMarry, Ann & Kam Photography, Cocoon Events Management Group, Taylor’d Events Group, Kaysha Weiner Photographer, Passport to Joy, 100 Candles, and Be Photography were featured in the Huffington Post article, Your 2017 Wedding: To DIY or Not to DIY, That is the Question. See the full feature here. Cescaphe Event Group was featured on Knotsvilla with a Christmas themed wedding. See the full feature here. Taylor’d Events Group was featured in 425 Magazine article, Theatrical Celebrations: 2017 Northwest Wedding Trends. See the full feature here. 100 Candles was featured on Catersource with their guest article, What’s New in Event Lighting for 2017. See the full article here. Destination Weddings Travel Group was featured on Special Events with their guest article, Designing the Destination Wedding Guest Experience. See the full article here. Passport to Joy, Fantasy Sound Event Services, Taylor’d Events Group, and Belladeux Event Design were featured on AllSeated in the article, Tips for navigating Wedding Party Tension. See the full feature here. Belladeux Event Design was featured on Special Events with the guest article, Trend Alert: Experiential Weddings in 2017. See the full article here.